Semo Dechen Yudron (‘Turquoise Radiance of Great Bliss’) (d.2007) was the eldest daughter of Dudjom Rinpoche and Sangyum Kusho Tseten Yudron. 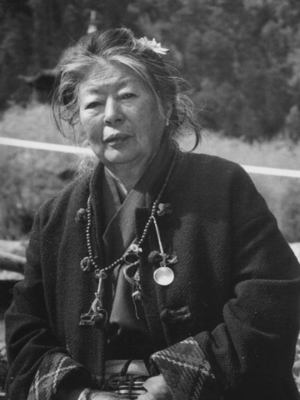 She stayed in Lhasa and took care of Dudjom Rinpoche's seat, Lama Ling, in Kongpo, with her husband Chonyi Rinpoche. According to Thinley Norbu Rinpoche, “she [had] a warm and open nature with everyone”. ↑ Thinley Norbu, A Brief Fantasy History of an Himalayan, Shambala, 2014, page 13. This page was last edited on 11 March 2015, at 13:13.